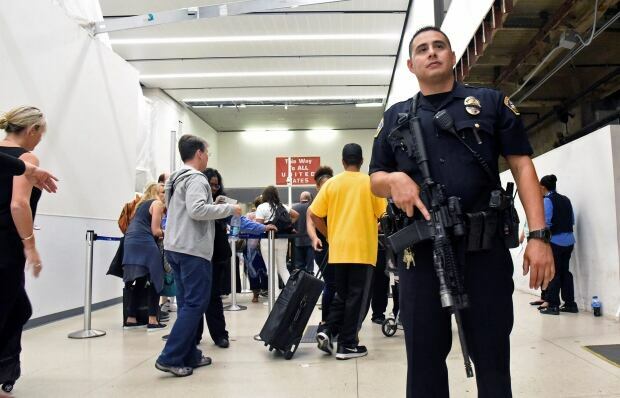 Reports of a gunman opening fire that turned out to be false caused panicked evacuations at Los Angeles International Airport on Sunday night, while flights to and from the airport saw major delays. A search through terminals brought no evidence of a gunman or shots fired, Los Angeles police spokesman Andy Neiman said. The reports were spurred by loud noises only, and police were still investigating to find the source of them, Neiman said. Airport officials said that a person wearing a Zorro costume was detained during the incident, but it wasn’t yet clear whether the person had any connection to the evacuation. The incident stirred chaos and left a mess as hundreds of people rushed from terminals on to sidewalks and the tarmac. It also left a mess in its aftermath with three terminals shut down, roads closed and flights held in the air and on the ground. All terminals and roads into the airport had been reopened by 11 p.m. PT, about two hours after the initial reports, officials said. But massive backup faced travelers in their cars and in security lines. Passengers who fled had to be rescreened through security. When the incident began, scores of people could be seen on social media and on TV news running from the terminal out on to the sidewalks and streets as police with rifles out stormed terminals. Many other evacuees were standing on the airport tarmac, and abandoned bags littered some sidewalks. Police officers, including one with a shotgun, eventually led passengers out of the terminal, through a security gate, and into a parking lot — where several hundred passengers waited for the terminal to reopen. Ninety minutes after the scare, Landis said he was still waiting for word on his flight. Passenger Scott McDonald said he was getting off a plane in the middle of the incident and was told by the crew to get back on. He said looking out the window he could see many evacuees gathered out on the tarmac, a strange sight even for someone who travels almost constantly. “I’ve never seen passengers, just normal people, on the tarmac anywhere in the United States,” McDonald told KCAL-TV. Douglas Lee, who was travelling home to Albuquerque with his wife and son, said the greater danger was from being trampled. “You can imagine hundreds of adults trying to go through an exit door onto the tarmac,” he explained. He said that to be safe, he dropped his backpack and picked up his young son. “I saw people running faster than I’ve ever seen people run just to get out of the way,” Nguyen said. It came just days after another false alarm led to a panicked evacuation of Kennedy Airport in New York. In that incident, police were investigating whether an overly boisterous celebration of the Olympics on Aug. 14 led to noises that were misinterpreted as gunfire, with the ensuing chain reaction turning into a panic as crowds ran to evacuate.